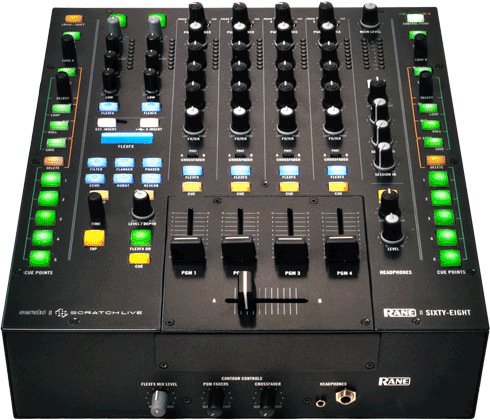 DJ Hardware - DJ Mixer - Rane Sixty Eight DJ Mixer Supports 4 Decks and 2 Laptops DJParts - All Variety of Parts that DJ Needs. 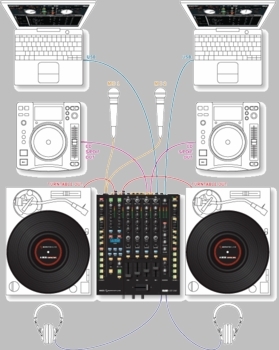 • Support for two DJs at once. 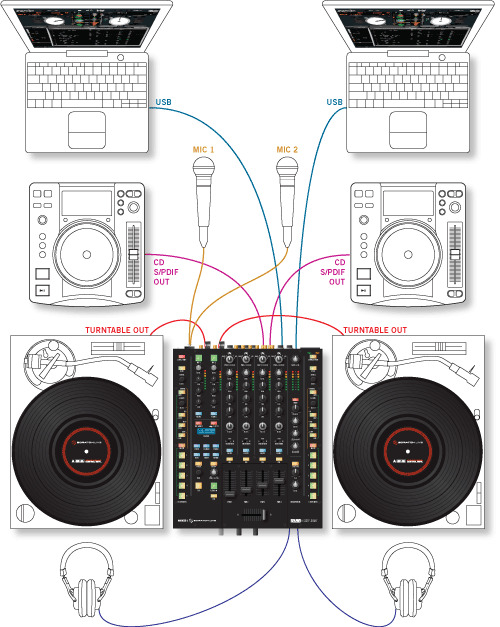 DJ handover is easy with two USB ports. Easily switch between two laptops without interrupting the music. e.g., DJ A can be playing out channels 1 and 2, and then hand off those channels one at a time to DJ B. 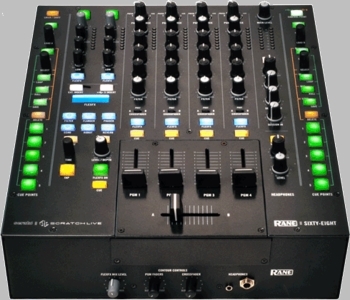 Two DJs can perform in parallel on the same mixer: Two DJs connect, configure which channels they output in software, and then DJ side by-side off the same mixer. eg., DJ A can play out channels 1 and 2, and DJ B can play out channels 3 and 4 at the same time. • Control of Scratch Live from the hardware control strips. A plug-and-play preset is included which performs standard functions (Library Navigation, Cues, Loops). Customizable presets for advanced users who will be able to switch groups, so the control strips become open-assignable like a MIDI controller, allowing custom functions and mapping. • Record your separate PGM inputs, FlexFX USB Send, Aux Inputs or Main Mix: all possible record sources. • SP-6 Sample player output assign to mixer channels. Additional output options are added to the SP-6 Sample Player, allowing a user to choose channels 1-4 or the FlexFX Return as the output. This allows three decks coming out of channels 1-3 and having the SP-6 coming out of channel 4. • Control and insertion of Software FX using the FlexFX USB Insert. • Record your mix to disk with pre-fader audio and fader automation recorded. This option allows a user to record not only audio, but fader automation. This can then be imported into a DAW for editing. The FlexFx Mix Level controls the level of the FlexFx signal going to the Main Mix. The Contour Control for the PGM Faders affects all four channel faders. The Contour Control for the Crossfader has a separate adjustment. Both 1/4" and 3.5mm headphone jacks are ready to plug into. The Fader section is easily removed for cleaning or replacement. The Sixty-Eight has four stereo analog inputs for PGM 1 through PGM 4. Any of these analog inputs may be set for Phono Input, Line Input or S/PDIF using the P - L - S switches on the rear panel. Any of the four analog inputs may be used for Scratch Live vinyl emulation control. Input 1 or Input 2 may be selected for Scratch Live Virtual Deck 1 control. Input 3 or 4 may be selected for Scratch Live Virtual Deck 2 control. Control input sources are selected in Scratch Live. The Mic Inputs accept an XLR or a balanced or unbalanced 1/4" plug. Mic 1 has a switchable phantom power option, and Mic 2 has a switchable line level option. All analog outputs come from the same “Main Mix” signal. Main, Booth and Session outputs each have their own Level control. The Main output is on balanced XLR jacks. The Booth output is on balanced 1/4˝ TRS (tip-ring-sleeve) jacks, though unbalanced TS (tip-sleeve) plugs may be used. The Session output is on regular unbalanced RCA jacks. Because all signals are identical, users may use any of these outputs as the “main” output if a different cable type is required for connection. * • Two independent USB 2.0 High Speed ports, each supporting twenty-two, 32-bit floating-point audio channels at 48 kHz. * • Real-time support for two computers. * • Support for 2, 3 or 4 Virtual Decks on one or two computers. * • Direct control of over 30 Scratch Live Library, Cue and Loop functions. o Process a sub-mix of up to six audio channels. o Six internal effects with seamless on-beat switching between effects. o External analog insert support for legacy hardware effects. o USB insert support for computer-based effects. o Four stereo Phono/CD inputs of Line, Phono or S/PDIF. o Four stereo auxiliary inputs. o Four stereo USB playback options. * • Two mic inputs: one with phantom power and one with line-level. * • 3-band full-cut EQ, plus new High-pass / Low-pass Filter. * • Flexible USB recording options, record from any PGM or output. * Note that we recommend Windows XP over Vista for performance reasons. By using XP, you can have a lower latency (for a better vinyl feel) and better performance in general. Please note: this is the minimum requirement to run Scratch Live. We recommend you use a higher spec computer, and particularly if you have a large library, you will benefit from having more RAM.